In case you haven’t heard, Starbucks is trying to woo you back. Or woo you for the first time. Or make you say “Whoo-hoo!” when you drink a cup of Starbucks drip coffee. 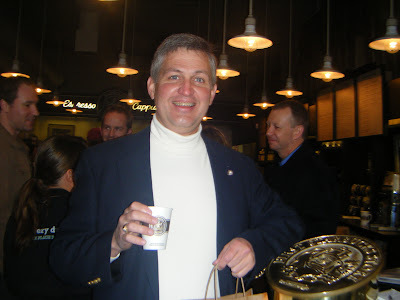 And so this morning, ’round 9am, with two mugs of homemade coffee already in my gullet, I went down to Pike Place Market to get a free cup of Starbucks’ new Pike Place Roast, which made its national debut today. No, Howard Schultz wasn’t there. He was in NYC drumming up business. (I did see him in the Market last week, chatting in front of a TV camera here at Starbucks, but unfortunately I didn’t have my camera handy. And I’ve also seen him — more than once — eating dinner at Lark, but that’s another story.) This morning, there were any number of friendly Starbucks corporate staff on hand, including this woman who works closely with Howard. Here she is talking to the TV cameras while her C.E.O. was in N.Y.C. pitching J.O.E. 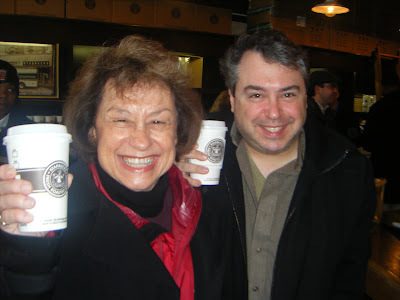 So, what were Shelly and Bruce doing in Seattle besides schmoozing with the old neighbor they never knew at the original Starbucks? “We were here for Taste Washington!” he said. So, nu? How was that wine-drinking extravaganza? “I love Washington wines!” Bruce said. “Me, too!” said his mother. Stay tuned to this blog and I’ll give you a first-hand account of the Grand Tasting event, held Sunday at Qwest Field Event Center. 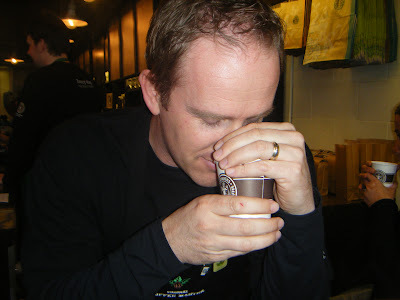 It was the most fun I’ve had since, well, since earlier today, when I was coffee-klatching with the Rosens! 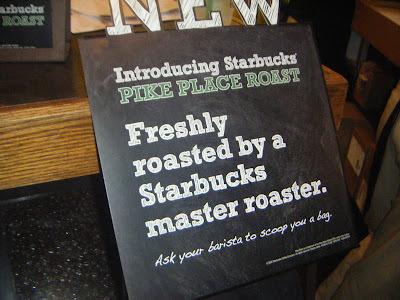 So, have any of you tasted the new Pike Place Roast yet? What do you think?